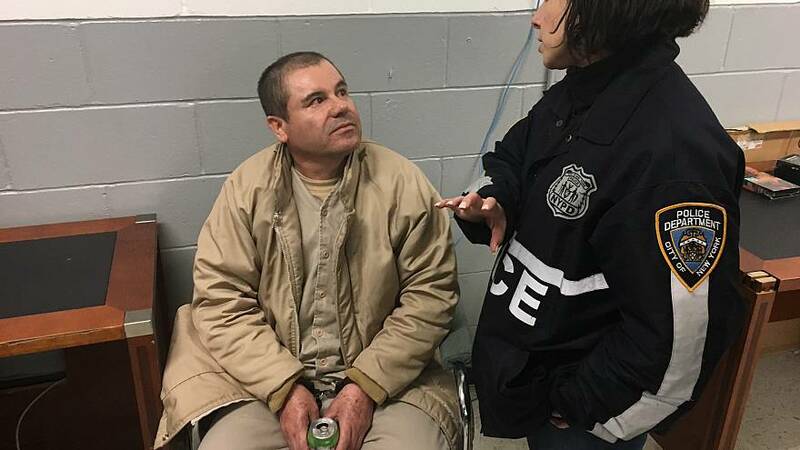 A New York City police officer talks with Joaquin "El Chapo" Guzman in this photo obtained by NBC News. El Chapo's lawyers say they have not received enough money to properly prepare for a trial in April. In a filing over the holiday weekend, attorneys representing cartel kingpin Joaquin Guzman asked a federal judge in Brooklyn to postpone the trial date from April to August or September so they can get up to speed. The legal team says that Guzman himself is resistant to putting the date off because he's being held under extremely restrictive conditions, and prosecutors only agreed to a two-month postponement. But lead defense lawyer Eduardo Balarezo, who took over the case from public defenders in October, said more time is needed to deal with the mountain of government evidence in the wide-ranging case. "Due to Mr. Guzmán's conditions of confinement and his inability to speak with specific family members to request that counsel's fees be paid, the defense is insufficiently funded at this time to be properly prepared for a trial less than four months away," he wrote. Guzman, was extradited from Mexico a year ago to stand trial in the U.S. on charges he ran the world's largest drug-trafficking cartel. Because he has escaped twice from Mexican lockups, he is held in near-isolation at a federal jail in Manhattan, kept in his cell for up to 23 hours a day with barely any visitors beyond legal counsel. In November, Balarezo complained to the court that El Chapo's mental state is deteriorating, and he is suffering hallucinations and memory loss. A judge approved a psychological examination for him. The government has not yet responded to the defense's request for a trial delay. Meanwhile, one of Guzman's closest associates has been extradited to the United States after a daring, eight-year undercover investigation. Victor Manuel Felix-Felix allegedly headed a money laundering and cocaine trafficking operation that is tied to the Sinaloa cartel, and his daughter is reportedly married to El Chapo's son, the Justice Department said.